There are some very important benefits of connecting mobile phone to computer to send sms. It is convenient to type sms on computer and send it using your mobile phone network. This is also useful, when you forget your mobile phone at home. You just need a Google account to connect mobile phone to computer to send sms. Some people chat with their friends using text messages. They use sms pack on their mobile number. This is not really the convenient method to chat. But if someone want to make it convenient, he can connect mobile phone to computer to send sms. Then he would be able to chat via text messages, just like any other internet messenger. You need to have an Android phone and active internet connection. Thus the application syncs the sms on your mobile phone with a computer or tablet application and allows you to send sms directly from a computer and tablet. You don’t need any specific computer, but a computer with internet connection and a web browser. This is also very very useful when you forget your phone at home or somewhere else. Thus you don’t need to have a direct access to your mobile phone to use it. You can access all the contacts on your phone and send sms to any one of them using computer. You also get informed about the calls came on your phone. Isn’t it great! MightyText is the Android application that syncs the text messages on your Android phone with the computer web application of MightyText. MightyText use your Google account to sync text messages on your mobile phone with computer, tablet application. MightyText application is available for free in Google Play. Install it on your Android phone. Then link your Google account to this application. Go to mightytext.net on your computer and click login. Login with your Google account. You are now logged into MightyText from your mobile and computer using your Google account. MightyText thus syncs the text messages on your mobile with computer using internet. You can compose a new message on your computer and send it to the contact using your mobile network. 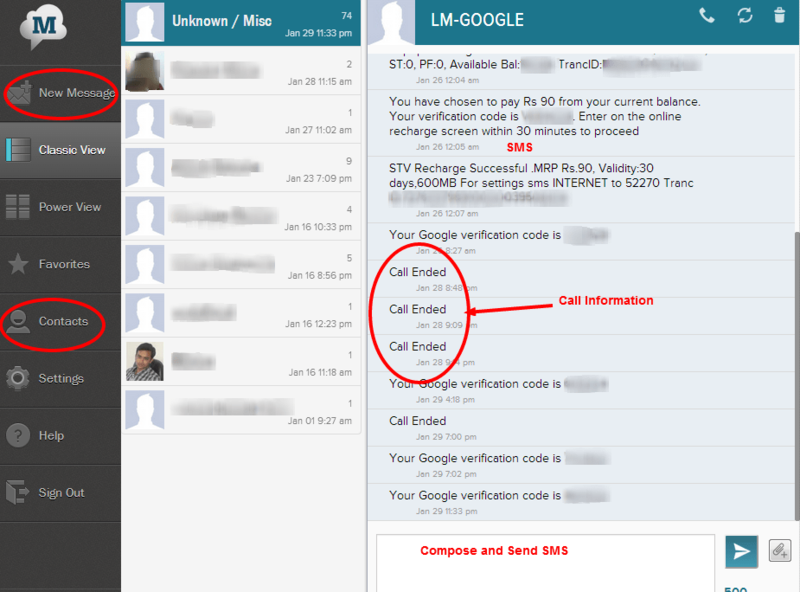 The contact will receive sms from your mobile number. MightyText also show the remaining battery life of your mobile phone. You can decide how long to keep sms from settings. All the contacts in your phone will be listed under Contacts section of web application. You can mark text messages as favorite. The Google chrome extension of MightyText is available in the Chrome Web Store. This is the top trending application and extension. Next Post How to Hide People You May Know from Facebook?